Namibia, April 2010 Another Safari, self drive this time we thought, loved the desert in Kalahari Desert already so Namibia was obvious. Booked flights via Airmiles, flew Frankfurt - Johannesburg - Windhuk. Picked up the car at the airport which we ordered via &Beyond who we did chose as our travelagent. We strongly recommend a 4x4 vehicle as a lot of the roads are not tared however in good conditions. Problem is while driving at a speed of 100km/h or so the car swims a bit with just 2 wheels under power. It helps to switch into 4 wheels drive street modus so when the car drifts its very easy to control. But don’t be afraid, it’s an easy trip and there was nothing which was scarry. We had lots of spare water and a spare wheel (we recommend one additional tyre as some which we met had to change their tyres). So we started from Windhuk, where we overnighted and went anti clock wise. Usually people tend to do it the otherway around. However anti clocke wise the exciement-curve slopes better we feel. How to travel with us? 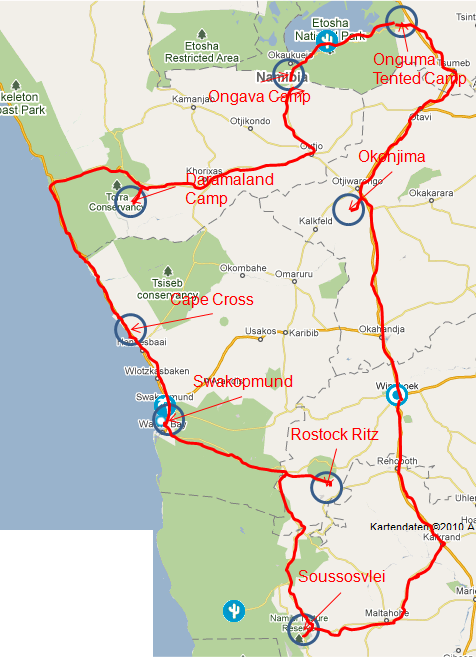 Start in Windhuk and click all other destinations - the map contains hyper-links - Enjoy!